There are some photographs too, but they’re stored in my phone, which I have conveniently left at a friends house. The elasticity of strawberry laces combines with their flexibility and comparative toughness to produce a structural component similar to a rubber band. I suspect that serious engineering work would be required to create an edible duck tape (I’m thinking caramel-soaked edible paper). 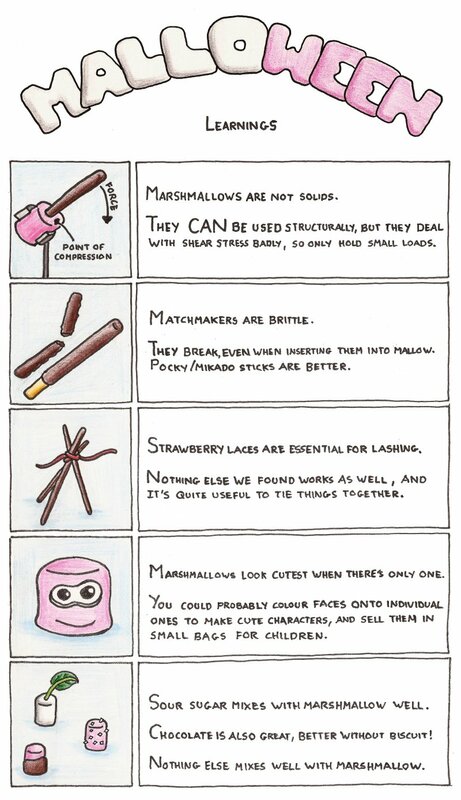 Also the cuteness index of your cute marshmallow is a little low. Something about those eyes looks suggestive rather than cute and I can’t work out what.